Dr. Deibel was born loving animals and developed a special interest in horses by the age of three. She grew up around Welsh ponies in Albany County, New York and owes much of her basic horse knowledge to them. She spent a summer at a riding school in her mother’s hometown of Verden/Aller, Germany, where she was introduced to dressage. As a young teenager, Dr. Deibel bought her first horse and supported it by teaching riding lessons and cleaning stalls. Upon graduating from high school, Dr. Deibel had to change the focus of her energy and finances from horses to her undergraduate education at Colgate University. While at Colgate she developed an interest in rowing. Her obsession with this sport consumed the three years after she received her bachelor’s degree, while she lived in Virginia and pursued a spot on the national team for rowing. There she met her future husband, Alton Anderson, who was stationed in Alexandria, VA with the Coast Guard. As her rowing career was winding down, Dr. Deibel found her way back to horses by teaching riding lessons and working in an eventing/sales barn as a groom. Her childhood dream of becoming a veterinarian resurfaced and she entered Cornell Veterinary College in the fall of 1995. After graduating with her DVM in May 1999, Dr. Deibel spent a year working in a mixed animal practice in Chatham, NY. Before joining Rhinebeck Equine in 2001, she worked with Granville Veterinary Service in northern NY. Dr. Deibel became a partner at Rhinebeck Equine in 2006. 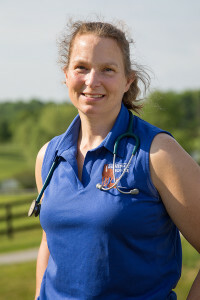 Dr. Deibel spends her free time with her husband, dogs, 3 horses and a miniature donkey. She enjoys riding, hiking, biking, paddling, swimming, running, skiing, gardening and just being outdoors.